Also available in SOBER. Perfect for those of you on a wild night out or celebrating a big occasion where lots of alcohol is bound to get drunk! 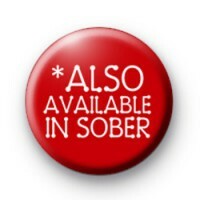 A bold red button badge with white text reading Also available in sober. This is the perfect badge for nights out and wedding, hen parties or just an old-fashioned night out. Also, perfect if you are celebrating a birthday. 25mm button badge hand made in the UK.